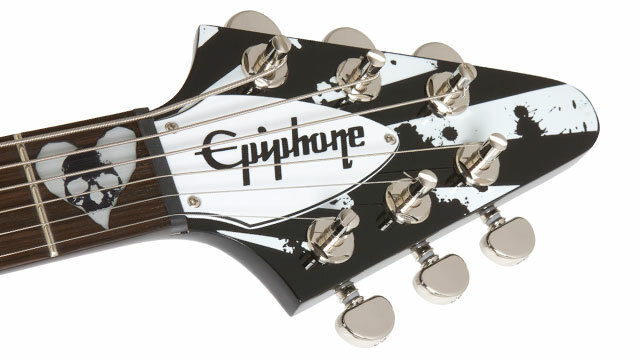 Epiphone gets heavy with the Robb Flynn Love/Death Baritone Flying V. Epiphone has been a favorite of heavy metal artists for more than a decade, not only for their great technical advances but also for their innovative artist collaborations. 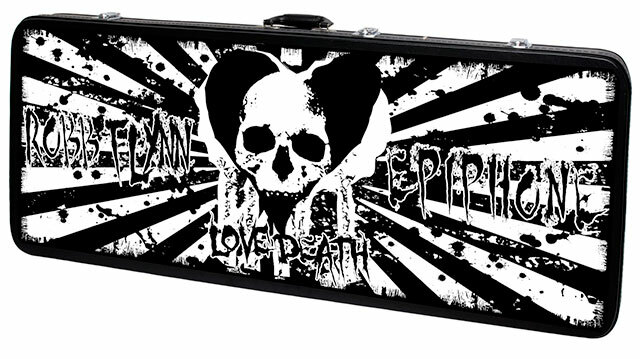 Now, Epiphone does it again with the Epiphone Robb Flynn Love/Death Baritone Flying V, designed in cooperation with Robb to be Epiphone’s lowest and heaviest (and we don’t mean weight-wise) guitar ever. And as with every Epiphone, the Love/Death comes with the peace of mind you get from our Epiphone Limited Lifetime Warranty backed by Gibson's famous 24/7/365 Customer Service. Go low and get heavy with the one-of-a-kind Epiphone Robb Flynn Love/Death Baritone Flying V.
Robb Flynn, founder, guitarist and vocalist for Machine Head, worked with Epiphone engineers to create the Epiphone Robb Flynn Love/Death Baritone Flying V, the first of its kind not only for Epiphone but for the Gibson family of brands as well. Robb has won countless awards including the Metal Hammer Golden Gods Award presented in 2007. And just like his music, Robb’s baritone design brings a totally original sound to metal and hard rock. “The main reason for having the slightly shorter 27.0” baritone scale is when you tune down to B, it just makes the low definition really tight, especially for palm muting and chunking,” remarks Flynn. “It opens up the sound a lot.” The guitar comes equipped with string gauges (low to high) .58, .42, .32, unwound .18, .13, and .10--the same that Robb uses on stage-- but can also accept heavier gauges. The Robb Flynn Love/Death Baritone Flying V features a mahogany body with an EMG-HA neck pickup and an EMG-81 bridge pickup. 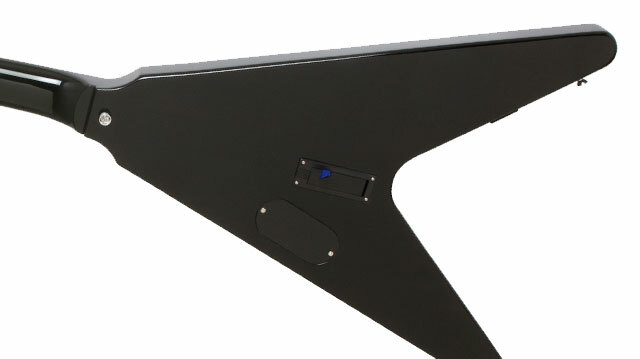 The EMG-HA neck pickup is a uniquely designed single-coil pickup inside a humbucker housing which keeps the classic look of a Flying V guitar but with something special under the hood. The EMG-HA debuted in 1974 as the first noiseless single coil pickup and features Alnico magnets for warmth and the widest possible frequency response for great definition and harmonics. It’s also a perfect choice for rhythm when matched with the low tuning of a baritone guitar, providing a solid “chunking” bedrock while still showing off all the complex overtones that are part of the baritone experience. The EMG-81 is one of EMG’s most requested pickups and utilizes powerful ceramic magnets and close aperture coils for incredible amounts of low end cut and fluid sustain. The EMG-81, combined with the unique intervals of baritone tuning, will slice through dense mixes and make your baritone leads sound thunderous. The mahogany SlimTaper™ "D"-profile neck features a 27” scale with a 1.68” graphite nut for precision tuning, an ebony fingerboard with “Love/Death” inlays and 24 medium jumbo frets. 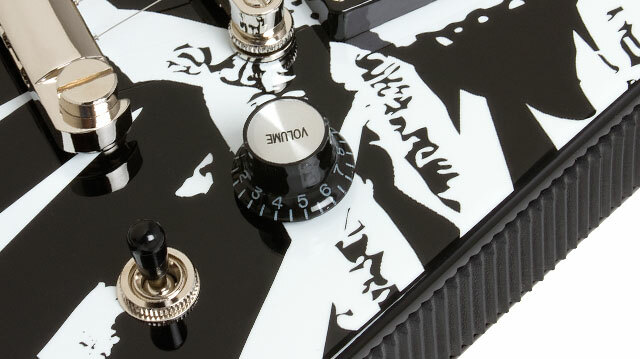 Controls are straightforward with a master volume and a 3-way toggle switch, chrome knobs, a standard 1/4” metal jack plate and Epiphone StrapLocks. Grover® locking tuners ensure on-stage precision. And like most Epiphones, the Love/Death's bridge is our industry standard LockTone™ Tune-o-matic Stopbar.